Abraham Nastapoka was a respected hunter and leader of a camp called Patirqtuuq, located in the Nastapoka Islands and River area. In the 1930s, he operated a small shop for the Baffin Trading Company on the Nastapoka River, from which he took his last name. 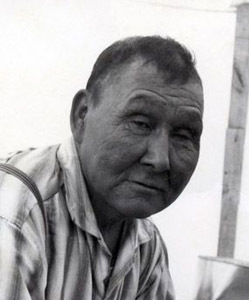 Nastapoka began carving at the age of 50, shortly after James Houston’s arrival in Inukjuak. Nastapoka and his wife, Meeko Sarah, worked on carvings together and, undoubtedly, influenced one another. Nastapoka had two sons, Johnny and Davidee, and a daughter, Geela, who also became artists. about 1974, when pain in his arms forced him to stop carving. A respected carver, Nastapoka’s work is included in numerous private and public collections throughout Canada. 2009 Early Masters. Winnipeg: Winnipeg Art Gallery.